Contact Lens Services - Warson Optics: Providing Quality Eye Care for Over 30 Years! At Warson Optics, we are known for our expertise in fitting contact lenses. There is a wide variety of contact lens choices available to patients. Based on how and when the patient plans to use their contacts, we recommend lenses that, in our experience, are likely to provide the best vision and comfort. -Daily disposable lenses, discarded after one day's use, are the healthiest and most convenient lenses. 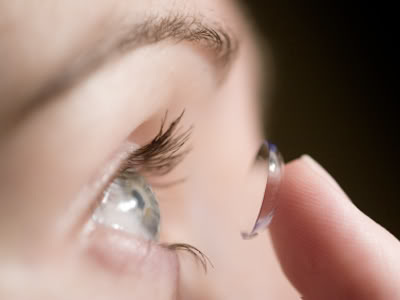 -Bi-weekly or monthly disposable lenses are removed each night, cleaned and stored. -Extended wear lenses do not need to be removed at night. -Astigmatic or toric contact lenses correct astigmatism, an irregular curvature of the cornea. They have a dual prescription and are weighted to stay correctly positioned. Multifocal contact lenses provide zones for different prescriptions, such as for reading and distance. Monovision achieves a bifocal effect by using lenses with two different prescriptions the distance prescription in one eye and the near prescription in the other. Rigid gas permeable are made of plastic and are long lasting. They can be a good choice for some patients with astigmatism, keratoconus, or multifocal prescriptions. Thinking about contacts? Call our office at 314-961-3151 to schedule a fitting with one of our knowledgeable doctors who can help chose the right lens for you.